ARLINGTON, VIRGINIA – The Global NextGen Award, developed by the Global Cold Chain Alliance (GCCA), recognizes outstanding young professionals in the world’s cold chain industry. 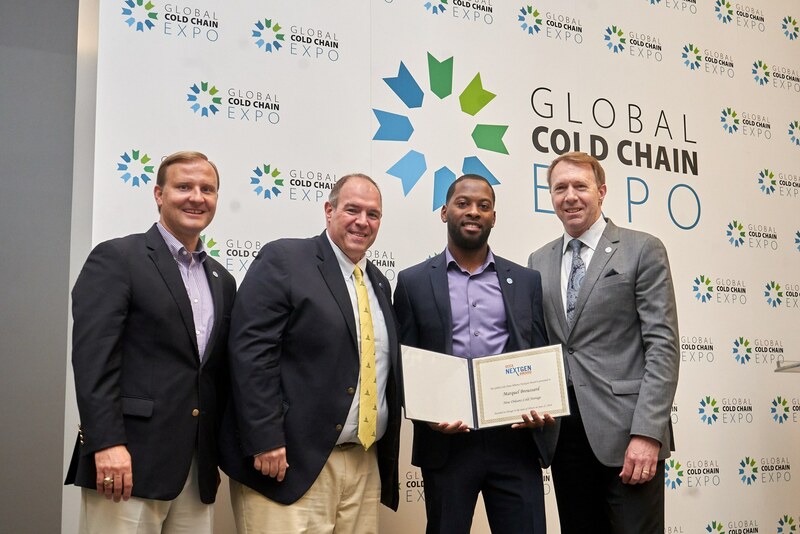 Marquel Broussard, New Orleans Cold Storage (NOCS), was named the recipient of the fourth annual award during a general session at the Global Cold Chain Expo, held June 25-27, 2018 in Chicago, Illinois. Broussard represented North America as the recipient of the Don Schlimme Future Leader Award during the 2018 IARW-WFLO Convention. The GCCA Global NextGen Award recognizes talented young professionals who have the potential to become future leaders and make a positive contribution to the development of the global temperature-controlled warehousing and logistics industry. Finalists for the award are recipients of industry awards that recognize exceptional achievement by young professionals in the cold chain in a specific region or country. Among other eligibility requirements for the award, nominees had to demonstrate excellence in their work, the potential to excel further in the many facets within the industry and possess insight into their organization’s strategic values and direction, policies and ways of working. As part of the selection process, each nominee was interviewed and judged by a panel of industry leaders from around the world. Candidates were evaluated on their knowledge level of the industry, track record of excellence, communication skills, and leadership skills. In addition, each candidate delivered a five-minute presentation to the panel of judges and the Global Cold Chain Expo attendees. As the recipient of the GCCA Global NextGen award, Broussard will receive a travel stipend to attend a GCCA or GCCA partner event anywhere in the world in 2018 and was presented with an engraved 2018 GCCA Global NextGen award. Download photos of the 2018 GCCA Global NextGen Award Finalists and Winner below. If you would like more photos, please contact Laura Poko at lpoko@gcca.org. Comprised of its Core Partners, including the International Association of Refrigerated Warehouses, the World Food Logistics Organization, the International Refrigerated Transportation Association, and the International Association for Cold Storage Construction, the Global Cold Chain Alliance (GCCA) represents all major industries engaged in temperature-controlled logistics. GCCA unites partners to be innovative leaders in the temperature-controlled products industry. For more information about GCCA, visit www.gcca.org.